It works great with the Google Apps. It is faster than Internet Explorer. So far I haven’t had any website ask me to install a toolbar to Chrome. The add ons help with using google apps. There are some website that just don’t operate the same. Example: Playing sound in the School Reach Program. 3. Click the “Accept and install” button. 4. The install with then start. 5. Somewhere during the process it will ask you if you want to make it your default browser. You can say yes or no, it is up to you. I chose yes. 6. When it is done installing you should now have a new icon on your desktop that looks like this. Creating a default home page. 1. Open up Google Chrome. 2. Click on the wrench icon in the top right corner of Google Chrome. 3. Click on the “Options” option. 4. In the “Home Page” section select the “Open this page” radio button and then type in the web address that you want to use as your home page. Have more than one home page. 4. In the “On Startup” section select the “Open the following pages:” radio button and then add the pages that you want to open up all at once when you first start Google Chrome. Add the bookmark bar and add bookmarks to it. 3. Hover your mouse over the “Bookmarks” option and then select the “Show bookmarks bar” option. 4. A gray section should now appear below your address bar. 5. Click the “Import bookmarks now” link if you want to bring your “Favorites” from Internet Explorer over to your Google Chrome. 6. If you want to add some of the sites that you go to the most, right click on the gray bar and then select the “Add page…” option. 7. 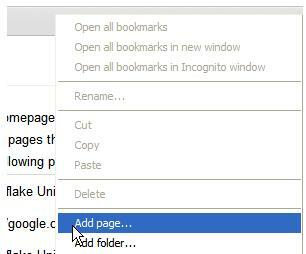 Give your bookmark a name and then type in the web address to the site, or you can always copy and past the address. Once you are done, click the “Done” button. 8. You should now see the name of the bookmark in the gray bar. 9. Click on it to make sure it works. It should take you directly to your Gmail. 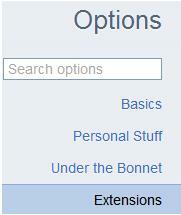 Extensions are small little add-ons that add features to your browser. Little programs that add functionality to give the browser a little more flexibility and power. There are hundreds of extension that are quite cool. The problem is that if you load a bunch on you start to slow your browser down. Also there are many that are fun but become addictive time wasters. Three Google apps extensions worth having. Save attachments that you get in Gmail, directly to your Gdocs so that you don’t have to download them. If you find a page that you like on the web, you can send it to your Gdocs as a PDF. If you find a page that you like, send the link to a friend by clicking a button. How to add Gapps extensions. Click on the wrench icon in the top right corner of Google Chrome. 6..Click the “Get more extensions” link at the bottom. 9. A dialogue box will pop up. Click the “Install” button. 10. That is all there is to it. Here is a list of search terms and extensions I like to use. Save those pesky Gmail attachments directly to Google Docs from the attachment list itself with a newly added Save To Docs link. Allows you to upload a pdf version of the current page to your Google Docs using the pdfcrowd service.